“Ukraine threatened to escalate tensions with Russia on Friday, with a top security official saying authorities could respond in kind to the detention of three Ukrainian naval ships. The detentions have drawn international condemnation. President Trump cited them as the reason he canceled a meeting with Russian leader Vladimir Putin at the Group of 20 summit in Buenos Aires.” (Wall Street Journal, December 1, 2018). 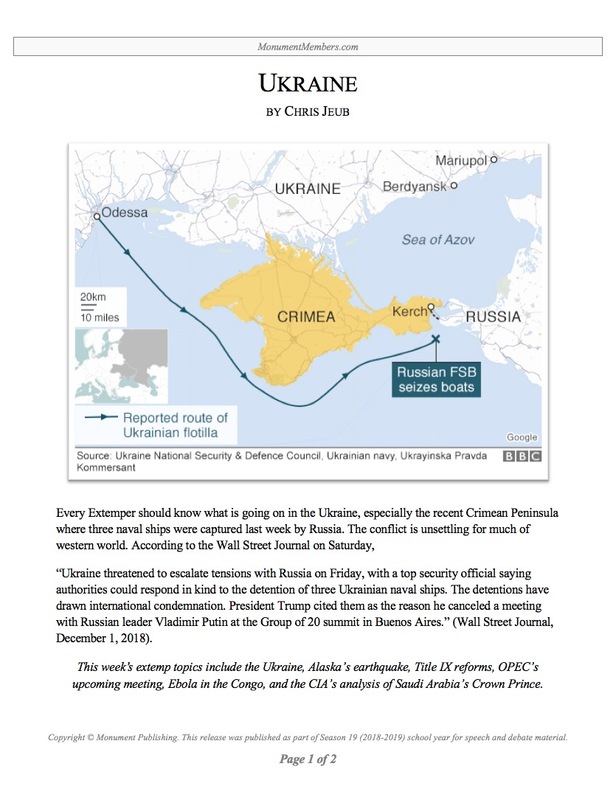 This week’s extemp topics include the Ukraine, Alaska’s earthquake, Title IX reforms, OPEC’s upcoming meeting, Ebola in the Congo, and the CIA’s analysis of Saudi Arabia’s Crown Prince.